DAYTONA BEACH, Fla. – When Michael Waltrip takes the green flag in the 55th running of the Daytona 500, he'll be in a used car no longer wanted by Earnhardt Ganassi Racing, one that has used parts purchased at auction or castoffs from Roush Yates. But that's not only what makes it so unique. The future No. 30 is sporting the number 26 this weekend in honor of the 26 victims of the December 14 tragedy at Sandy Hook Elementary School in Newtown, Conn. It will also adorn the number 80888, the number to which people can text donations to the Sandy Hook School Support Fund. Before a preseason meeting in January, car owner Brandon Davis and driver David Stremme were approached by NASCAR president Mike Helton. Davis, who purchased Inception Motorsports last year and renamed it Swan Racing, laughs when he tells the story now, but he recalls the possible reasons that Helton would want to talk to an owner who just entered the sport, not to mention a team that hadn't run the entire 36-race the year before. "And we sat there and I was nervous the whole time, like 'Man, should I just leave this thing?' After it was over with, he came over and said 'Hey, I have this idea. Since Michael’s in the car, and I mentioned this to Michael, running the 26 for the 26 people that lost their lives in Newtown.' It was 100 percent Mike Helton. Mike Helton made that deal happen." The partnership was announced on February 14th, with NASCAR CEO Brian France and wife Amy making a $50,000 donation to the fund with a matching gift from the NASCAR Foundation. Stremme, who was a minority owner in Inception before Davis bought the team, will be the driver for the remainder of the season but is stepping aside this weekend for the higher profile of Waltrip. "Stremme wants to race the Daytona 500 just like I did and it’s his car," Waltrip said. "But he thought that me driving it would strengthen his relationship with Toyota and really bring his team into the family more." Stremme made his Cup Series debut for Chip Ganassi in 2005, but hadn't had a full-time ride since 2009. That's when he went searching for partners to start their own team. His idea: go to auctions and buy as many good parts as he could for as cheaply as possible, something he still does today for Swan as a self-professed "man of many hats." "I still do," Stremme said. "We race off of other people’s leftovers, I guess you would say. … And there’s a lot of things that teams waste and do things, and we’re able to go still race. Like this car here that we’re running, is Jamie McMurray’s Shootout car from last year. " McMurray wrecked in that race. "We fixed it, put a Toyota body on it and done everything. That’s the way that we have to build this organization is be smart about our money. "It’s just multiple areas we purchase from and we make it work. A lot of it is we might have some big team might say, ‘Hey, we’re getting rid of all these brakes,’ and there’s nothing wrong with them, they just want to change manufacturers and we buy them." 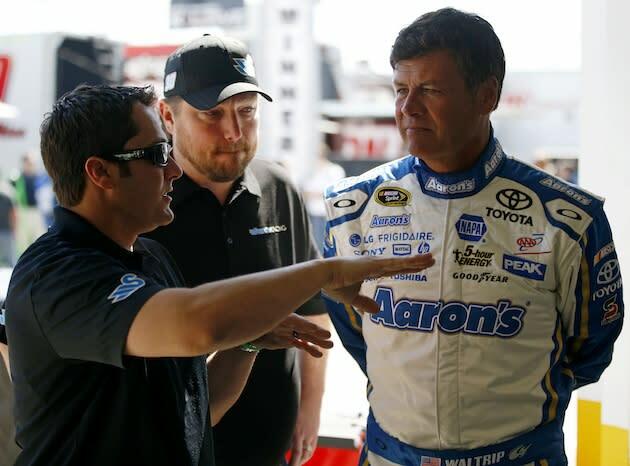 Stremme met Davis, CEO of Swan Energy, at Talladega last spring where he pitched him on buying the team. Davis gave Stremme his business card and told him to call him if he was serious, Stremme did just that, and Davis finalized the purchase in the fall. In the offseason, the team hired crew chief Tony Eury Jr. and Steve Hmiel as its director of competition. Eury Jr. and Hmiel worked together at Dale Earnhardt Inc. while Eury Jr. was crew chiefing for Dale Earnhardt Jr. Last year, Eury Jr. served as Danica Patrick's crew chief in the Nationwide Series for 26 races before parting ways with JR Motorsports. That name recognition from working with both Junior and Patrick was a big draw for Davis. "And Tony was at the top of the list, but for me, it pushed it over the top that people know who Tony is. That Tony has a fan base. No other crew chief had a fan base. And if we’re going to build this team, we have to develop that. For the team, for the driver, for Tony, and our overall product, just everything that we bring to the table, it needs to be known." Speedweeks has helped with that awareness. Not only for Newtown, but for Swan. "The goal is to make the race. We did that," Waltrip said. "The goal was to build the team. I think we’ve been able to do that. And the goal was to have something cool on the car for the 500 and I know we did that." 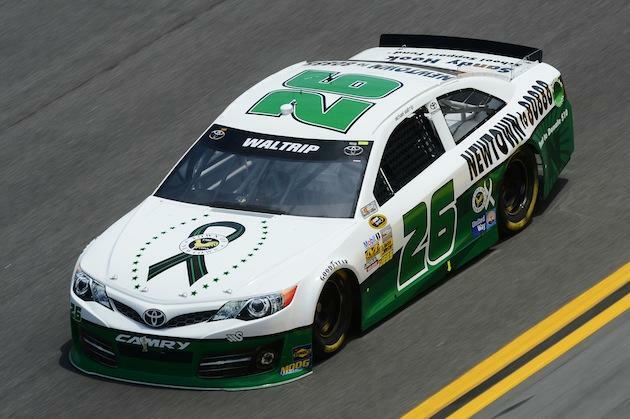 Waltrip can relate to what it can be like to be a new owner in NASCAR, having started Michael Waltrip Racing seven years ago and gone from missing the Daytona 500 and being penalized in his team's debut 2007 season to two of his drivers making the Chase for the Sprint Cup last year. "Our team has made a 180," he said. "And everybody thinks it happened overnight but it’s actually taken about seven years. And so I lived it, I experienced it, I’m very knowledgeable about everything we went through in order to get where we are and I’m really thankful that David included me in the family to help them try to maybe get to where we are now without some of the hurdles we had to overcome." Many new teams have come and gone in the six years since Waltrip became a team owner, and both Stremme and Davis are cognizant of the financial pitfalls of racing at NASCAR's top level. That's why Stremme's still going to those auctions. "Steve and Tony and myself, we’re all very hands on," Stremme said. "Everyone on the crew, we do what we’ve got to do and those guys work hard. Instead of having seven guys and three dogs before, we’ve got 20 guys and three dogs. We’re still the same people and it’s just an old-school mentality of racers and I feel like we’ll be able to survive off of that mentality."